Abstract: With wavelengths of a few to tens of nanometers extreme ultraviolet (EUV) and soft x-ray (SXR) light is being exploited in a rapidly increasing number of scientific and technological applications, from imaging to spectroscopy, to the lithography of semiconductor chips with 13.5 nm wavelength light. Recent advances in the generation of bright EUV/SXR laser beams on a table top are opening unique opportunities to advance photonics in this challenging and relatively unexplored region of the electromagnetic spectrum. This presentation will review results of efforts at Colorado State University on the generation and utilization of EUV/SXR lasers for nanoscale imaging, nano-spectrometry imaging and nanopatterning. These photonic applications are making possible the imaging of nanostructures and their dynamics, the three dimensional nanoscale mapping of the chemical composition of organic and inorganic materials, and the printing of periodic arrays of nanoscale features error-free, providing new opportunities to access and probe the nanoworld. 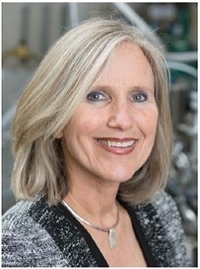 Biography: Carmen S. Menoni is University Distinguished Professor in the Department of Electrical and Computer Engineering, Department of Chemistry, and the School of Biomedical Engineering at Colorado State University. Prof. Menoni’s research bridges from optics to material science. She is engaged in the growth and characterization of metal-oxides for the engineering of interference coatings for high power lasers. She is also actively involved in using bright soft x-ray laser beams with wavelengths between 10-50 nm for applications such as nanoscale morphological and compositional imaging. Her work has been published in over 200 refereed journal and proceeding papers. Prof. Menoni and her team received in 2008 a “R&D 100 Award” for the invention of a table-top 46.9 nm wavelength microscope that captures flash images with wavelength spatial resolution. Prof. Menoni is Fellow of the Institute of Electrical & Electronic Engineers (IEEE), the Optical Society of America (OSA), the American Physical Society (APS), and the International Society for Optics and Photonics (SPIE). Prof. Menoni is founding editor and present Editor-in-Chief for IEEE Photonics Journal. In 2014-2015 is IEEE Distinguished Lecturer for the Photonics Society.